Did someone say party? Time to get the fun started our Sweet Party hamper! 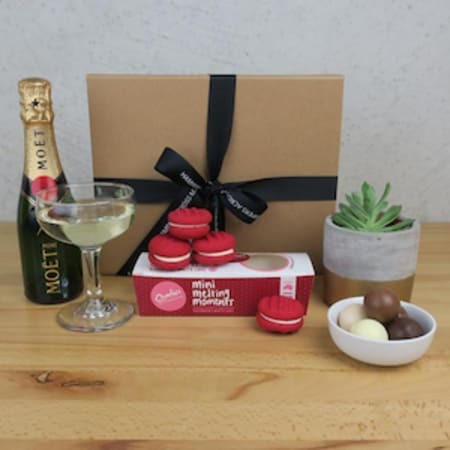 Pop goes the mini bottle of Moët champagne, a perfect way to toast a birthday, anniversary or work promotion, while two tasty treats, a box of Charlie's raspberry and white chocolate Mini Melting Moments cookies and divine Lindt truffles, make this gift even better. We've also included a beautiful living succulent plant to add a splash of green to your special recipient's home. A gorgeous little succulent in a concrete pot with a gold rim.